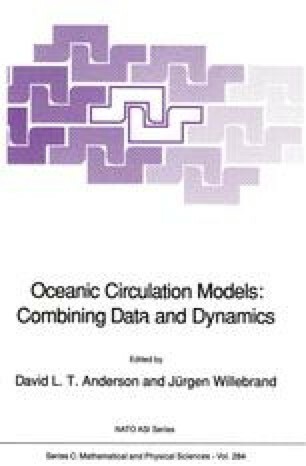 The problem of “driving” the phase space trajectory of an ocean model such that it comes “close” to observations distributed in space and time is discussed. The approach taken is one of optimization where a distance function I is minimized while the model equations act as hard (i.e. equality-) constraints. In this case model trajectories are subject only to model physics, initial- and boundary conditions. As a consequence changes in the trajectories can only be achieved via control variables u that describe the conditions mentioned like external forcing driving the circulation or that describe model physics like friction and diffusion parameterization. By changing only control variables and letting the model evolve according to its equations of motion the constrained problem in the space of model and control variables is changed into an unconstrained problem in the space of control variables. The optimization is performed iteratively: first an initial guess of u is taken, then the distance function I is evaluated by integrating the ocean model for a time interval in which tracer (or other) measurements are available. The gradient of I with respect to u is calculated with the aid of the adjoint model which is integrated backwards for the same time interval. Subsequently an unconstrained minimization algorithm is used to perform the optimization in u-space.